UPDATED, Oct. 6, 2010 — Fidel Suarez was released in October 2010 under a deal struck by Spain, the Castro dictatorship and the Catholic Church of Cuba. 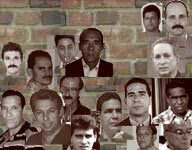 Fidel Suarez Cruz, a farmer from Pinar del Rio, had a couple strikes against him — at least in the evil eyes of the Cuban dictatorship — when he was arrested during the "black spring" of March-April 2003 and sentenced to 20 years in prison. Suarez, who is in his mid-30s, was a human rights activist, and then he dared to spread his message of hope and liberty as an independent librarian. About the only thing worse, again in the eyes of the tyranny, would be if he also worked as a journalist. Because of his admirable beliefs in freedom, democracy, and human rights, Mr. Suarez Cruz has been the target of the nightmare called the Castro regime. According to Amnesty International, in 2000 Mr. Suarez Cruz was sentenced to 6 months of restricted freedom for "disobedience'' for fishing in a restricted area: however, this sentenced was changed to imprisonment in the totalitarian gulag because he was arrested for carrying out peaceful political activities. On March 18, 2003, as part of the dictator's condemnable crackdown on peaceful pro-democracy activists, Mr. Suarez Cruz was arrested because of his belief in freedom and human rights. In a sham trial, he was "sentenced'' to 20 years in the inhuman, totalitarian gulag. Mr. Suarez Cruz is currently languishing in an infernal cell in the totalitarian gulag. These depraved conditions are truly appalling. The State Department describes the conditions in the gulag as, "harsh and life threatening.'' The State Department also reports that police and prison officials beat, neglect, isolate, and deny medical treatment to detainees and prisoners, including those convicted of political crimes. It is a crime of the highest order that people who work for freedom are imprisoned in these nightmarish conditions.